The golden light lingered endlessly on across the over ripe grass, barely noticing the clouds brewing themselves into a hug black bruise. Silently the dark energy gathered, a whisper rolling in unseen from the edges. The angry clouds blustered in triumph across the sky, and the summer sun was suddenly gone. In swept the wild cold wind of the storm, and trees bowed in surrender as the land was lashed. All through the night she was relentless stripping branches of their summer rags, snapping limbs and plucking tiles from innocent roofs. In a final act of revenge she whipped random objects up into her swirling cape, never to be seen again on earth. Happy with her work she sighed out, and let the golden sunbeams peep through her dark clothes in little pools. The air came to rest once more, but winter had left her calling card loud and clear. She was back, and biding her time…. Can you enjoy the wild energy of the storm, or does your mind drag you out of the moment and forward into the days to come? Autumn seems to be a time when many struggle with the thoughts of the winter and the darkness to come. Yet we don’t really know what winter will bring us. It’s a time for turning inwards, a time to slow down a little and reconnect with ourselves and our inner world…..but perhaps that where the real struggle lies. Try connecting with the wild winds sweeping across the land today. Stand with your arms outstretched and feel its energy tugging at your clothes and hair. Watch it swirling and rippling through the trees and grass. Feel it’s insistence that you stay right here in the present moment, just for a little while at least, amazed by its energy and power. She’s a wild woman the Cailleach of Winter, but she’s full of surprising wisdom and beauty. 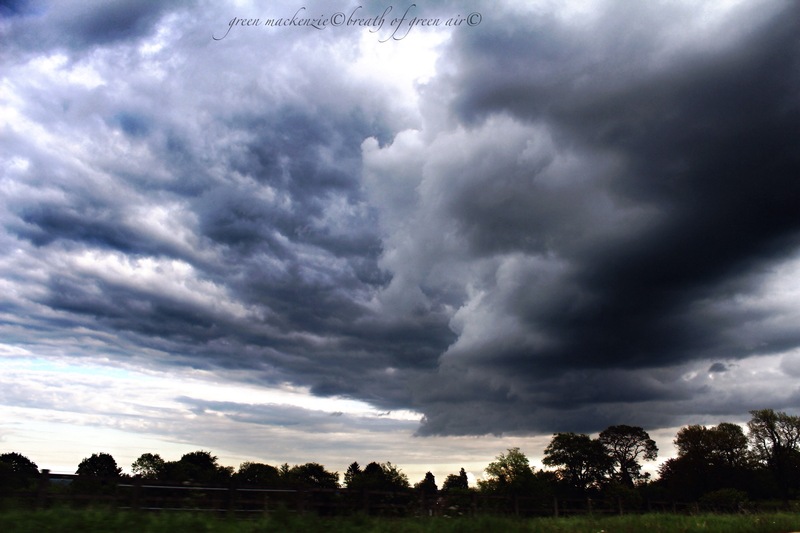 This entry was posted in elemental, nature photo, poem and tagged change, clouds, elemental, mindfulness, nature, photography, spiritual, storm clouds, storms. Bookmark the permalink. I join in with the others – your gravatar is mysterious and looking for More…Nicely done! Awesome post!!! The photos, always! The words … even more so. That last paragraph in particular really speaks to me. You describe so well what I have felt … standing in the wind, arms outstretched, feeling the energy. 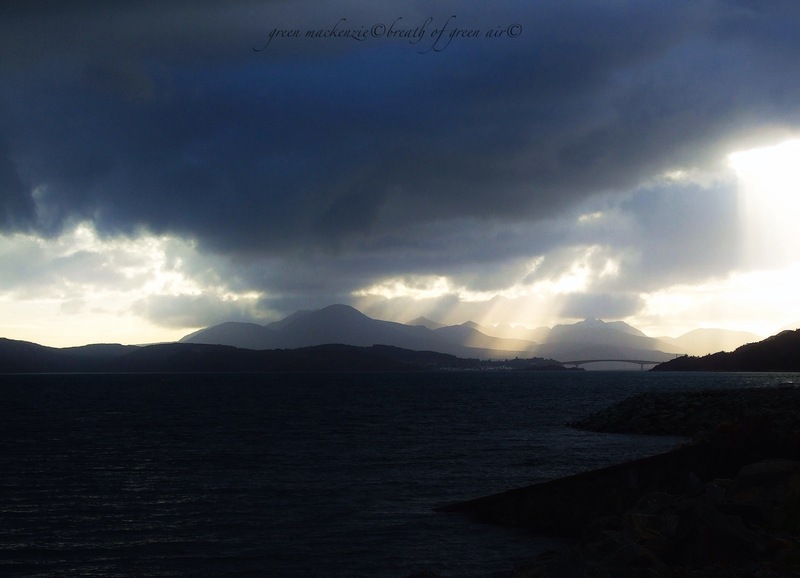 Seonaid, your prose and images are beautifully evocative. Your narratives for Mother Nature never fail to touch exactly what I’m thinking yet could never articulate. You really should try to get published :-). I love storms and winter and fall and, well, all the seasons! Winter especially, though, for it’s the best time for woodland hikes and really seeing our world stripped down. Well done. Thank you :-). Until then there’s the blog, and I love sharing this way! That sunset was magical….I cheated a little as it’s from last September, but it fitted the theme of my post so well….and it’s good to share such magic. Your photos are dramatic and spectacular! I LOVE the change in Seasons… especially Fall and Spring… they cleanse my soul! Thank you for sharing your beautiful world. The changing seasons are such a gift aren’t they….a chance to renew and refresh in many different ways. We had such a storm roll in yesterday as spring and winter dance their own special battle. Today all that bluster and heaviness is gone and the sun pours down. We also had a sizeable earthquake yesterday so it was a day of elemental forces. 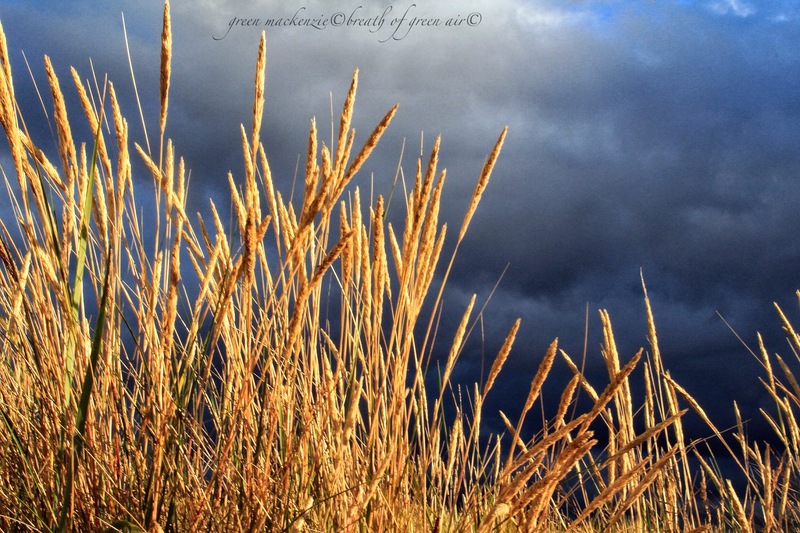 I can never resist golden sunlit grass across a dark brooding sky….it stirs something deep in my soul! I’m glad you love it too, thank you. Blogging offers such close connection to our similarities and experiences. Nature was in command here yesterday and showing its total beauty and peace today. Perhaps the photo touches are awareness of the light and the dark sides of our good selves or maybe the simplicity of observing the light in its many forms. The light and dark within ourselves is an interesting thing to ponder as the external balance of light shifts. Sometimes we can find treasure buried in the darkness…. Delighted you enjoyed my dramatic interlude David, the energy at this time of year gets into my bones, and so I’ve been very busy getting things ‘sorted’! Well internationally renowned writer was exactly the look I was going for!! Perhaps the gravatar alone will jump start my new career, without me having to do any actual writing….here’s hoping. I wonder if I might have encouraged you just a tiny bit 🙂 Love your cheeky new avatar! Oh I think you have encouraged me lots in so many ways Gilly! What a beautiful new gravatar!! What a beautiful reminder to focus on the moment: a reminder than I can’t get too often! Thanks. I believe those of us who live with strong, contrasting seasons are lucky to do so. We can learn from them as you say, and draw energy from the dynamics as each shifts to the next. This is a magnificent post. I love little more than to stand and let the wind take me to myself. Nice. All good, but mark photo one as a favorite over here. I love all the seasons but I love the stormy representation of each the most. A storm captures my attention and therefore, even though I may be snug inside, I am more in tune with elements than when all is calm outside. 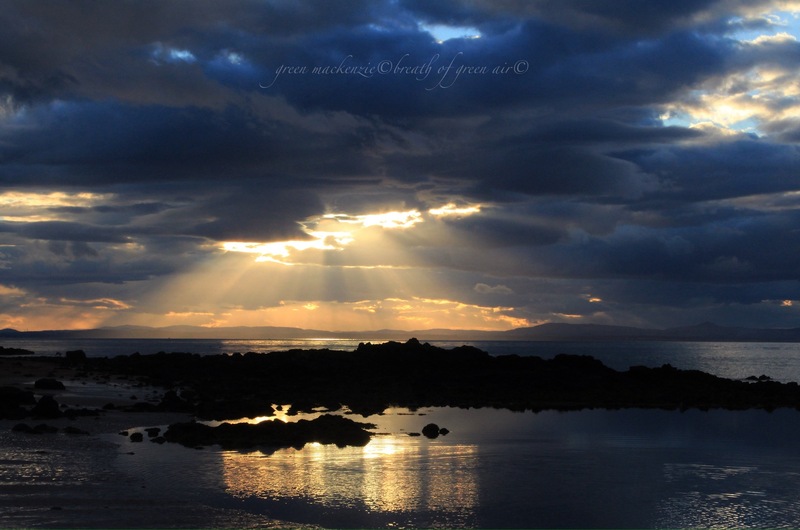 Stunningly evocative pictures Seonaid! Dramatic to say the least. I was having a dramatic morning Caro! My mother-in-law is a great quilter, I’m not sure I have the patience, but I love the results! Another beautiful and evocative piece. You have the soul of a poet. That last photo is too beautiful for words. The energy in a storm definitely lets you know you’re alive! As for your camera….your photos are beautiful. You have no weather John? I was a bit scared, tbh. Our giant oak – that obscures our house on Google view (or whatever it is called) – was creaking like anything. Today is not much better. Still, we are warm and dry inside. Lovely pictures Seonaid! The view from Reraig is always truely breathtaking I find. So is mine towards the Five Sisters….